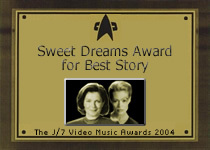 This video was created as a collaboration between the vidders who like to lurk around the janewayseven.com message board. They decided it might be a good idea to take a single song, storyboard it and vid it in sections, before joining it all together. You can judge the result for yourself! This video tells the real story behind Endgame!